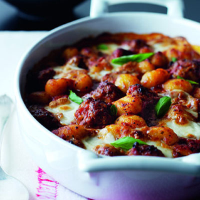 This easy midweek family meal can be on the table in 20 minutes, using ready-made gnocchi, pork meatballs and a herby pasta sauce. Heat the oil in a large pan and fry the meatballs for 5-6 minutes, until lightly browned, turning occasionally. Stir in the pasta sauce. Cover and cook for 5 minutes. Meanwhile, cook the gnocchi according to pack instructions. Preheat the grill to a moderate temperature. Drain the gnocchi and stir into the meatball mixture. Transfer to a heatproof dish then slice or tear the mozzarella into pieces and scatter over the top. Grill for 4-5 minutes until the cheese has melted and is bubbling. Garnish with the basil and serve immediately with a fresh salad such as Waitrose Continental Salad. Try different tomato sauces, such as Waitrose Italian Arrabbiata Pasta Sauce, for a spicier dish. Use lightly cooked pasta shapes in place of the gnocchi, if preferred.